Author(s): Juliana F. Barbosa, Sonia M. de Figueiredo, Sandra Lyon, Rachel B. Caligiorne. Nucleo de Pos-Graduacao e Pesquisa da Santa Casa de Belo Horizonte, Rua Domingos Vieira, 590, CEP: 30150240-Belo Horizonte, MG, Brazil. Background: Visceral leishmaniasis (VL) is a zooanthroponosis affecting both rural and periurban areas, and can also spread into urban areas. VL has emerged in many countries in the world, presenting new cases in new countries of occurrence. Thus, studies concerning epidemiological aspects in different world regions are very meaningful. 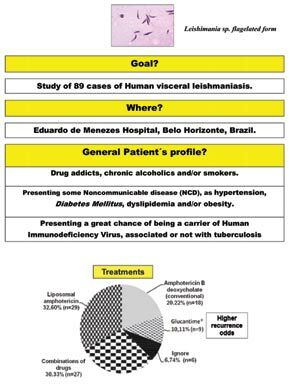 Methods: With this purpose, this study analyzed 89 cases of VL, treated between June 2006 and June 2014 at Eduardo de Menezes Hospital (HEM), a Reference Center of Infectious Diseases situated in Belo Horizonte, in Minas Gerais state, Brazil. Results: According to the results, it was observed that males are mostly infected (84%/n=75) and the most affected age range was 20-49 years old (83%/n=74). The treatment liposomal amphotericin B (33%/n=29) was mostly used. Recurrences were more frequent in patients treated with Glucantime® (17%/n=9). No side effects were reported among the 29 patients treated with liposomal amphotericin B. On the other hand, there were 23 cases related to the occurrence of acute renal failure (ARF) and the use of conventional amphotericin B, both when it was administered alone or in combination with other drugs. Additionally, we observed a close relationship between the VL and HIV infection, observing a coinfection rate of 28.1% (n=25). Conclusion: From the survey data, it was possible to conclude that the majority of VL patient treated at HEM is male, classified as brown racial group, economically active, and may be drug addicts, chronic alcoholics and/or smokers. They may present some Non-communicable diseases (NCD), such as hypertension, diabetes mellitus, dyslipidemia and/or obesity and, predominantly present a great chance of being a carrier of the Human Immunodeficiency Virus, associated or not with tuberculosis. As symptoms, these patients possibly will present hepatosplenomegaly, fever and pronounced weight loss. Keywords: Amphotericin B, HIV/Aids, Leishmania spp, visceral leishmaniasis. Affiliation:Nucleo de Pos-Graduacao e Pesquisa da Santa Casa de Belo Horizonte, Rua Domingos Vieira, 590, CEP: 30150240-Belo Horizonte, MG, Brazil. Keywords:Amphotericin B, HIV/Aids, Leishmania spp, visceral leishmaniasis. Abstract:Background: Visceral leishmaniasis (VL) is a zooanthroponosis affecting both rural and periurban areas, and can also spread into urban areas. VL has emerged in many countries in the world, presenting new cases in new countries of occurrence. Thus, studies concerning epidemiological aspects in different world regions are very meaningful.